Carved mahogany, embroidered upholstered seat. 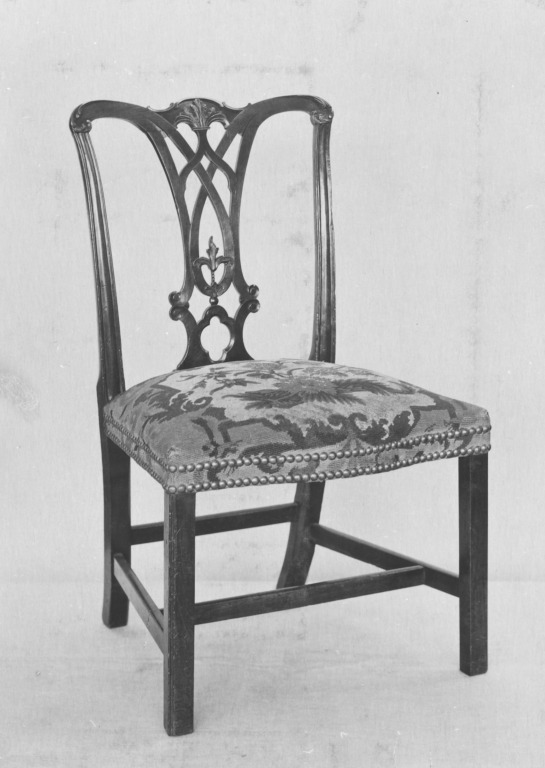 One of a pair of chairs in carved mahogany with upholstered seat. The serpentine top rail is carved with foliage and ends in scrolls where it joins the uprights. The open rectangular back has a pierced and carved splat with flowing ribbon-like carving which sits on a shoe with a pierced quatrefoil. The uprights are reeded. The square front legs are plain and the back legs curve outwards; they are joined by four plain cross rails. The seat is covered in contemporary floral embroidery in silks and wool and double-nailed. The chairs were bequeathed to the Museum by Colonel Croft Lyons per Mill Stephenson Esq. FSA 38 Ritherdon Road SW7. They were formerly on loan to the Museum. Mahogany chair with embroidered seat. 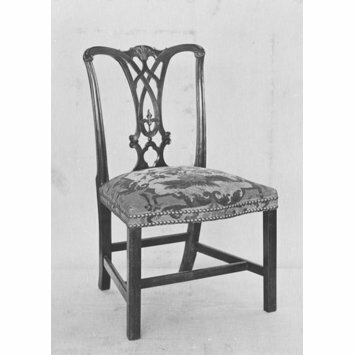 The chair is illustrated as figure 67 in English Chairs published by HMSO in 1951 and wrongly described as W.56-1962.